“There is another world, but it is in this one” – and the characters in this novel, in their different ways, mean to find it. Kris and Jane are an idealistic young couple who have bought a run-down place near Albi, city of the Cathars. But Jane has had enough and gone back to London to earn money to pay for repairs, leaving Kris to pursue their dreams alone. Through the sweltering summer, as the drought intensifies, Kris learns traditional skills from his paysan neighbour, Gaston, builds a mysterious tower (he doesn’t know why), and begins to revive La Balme. Through work, and meeting the motley incomers: enigmatic Sylvie, Fred the revolutionary, Edvard and his magical domain, self-sufficient André, Kris feel he is beginning to find himself and his place. When he meets and has an affair with Gabrielle, a young Parisienne full of the spirit of May ’68, he discovers with her the purpose of his tower, and glimpses a new world coming into being. But when a transformed and resolute Jane returns, he must face the question – which future world does he really want? 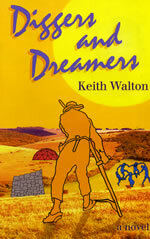 With its rich cast of characters, and exact descriptions of rural living, Diggers and Dreamers is both a timeless story of city-dwellers starting up in the country, and a time capsule from an era when it was still seemed possible to “treat your desires as realities” and set about creating a new world. Have meant to contact you for a long time (met Sebastian at an Arvon week years ago). I enjoyed the book very much, btw. Interested to see la meridienne verte – do you know Graham Robb’s book? Hi Roselle, great to hear from you, and thanks for being in touch. I’m glad you enjoyed Diggers. Ah, vendange, meeting Luigi, and a decorated birthday cake … I’d love to say it was me, but, no, another Keith, I’m afraid. I was apple-picking that summer. I finished my meridian ride not far from Ceret, and climbed up through the vineyards to the Spanish border, following Walter Benjamin’s escape route. And I enjoyed Ceret cherries! Yes, it was The Discovery of France that introduced me to the green meridian. And then I read his The Ancient Paths – Discovering the Lost Map of Celtic Europe, a fascinating (if speculative) exploration of the the Celtic past, with a meridian close to the Paris one. It was amazing to revisit, on my ride, the place I’d lived forty years ago, the La Balme of Diggers. Such changes! It really was the end of an era. I hope you enjoy the blog. I shall enjoy exploring your websites and work.